Extant Sphenisciformes occur on all continents of the Southern Hemisphere and include 17 species, whose standing height ranges from about 40 cm (Little Blue Penguin, Eudyptula minor) to slightly more than 1 m (Emperor Penguin, Aptenodytes forsteri). Owing to the fact that penguin bones are fairly robust, and because these birds live in an aquatic environment which offers favorable conditions for fossiliza-tion, their fossil record is very extensive and dates back into the Paleocene. Sphenisciformes were only briefly treated in earlier reviews of fossil birds (Olson 1985; Feduccia 1999), but in recent years several revisions were published. These greatly contribute to a clarification of the complicated taxonomy of Paleogene Sphenisciformes, and form the basis of the present account. All penguin fossils were found in the Southern Hemisphere, and Paleogene remains of penguins are known from Antarctica, New Zealand, Australia, and South America. No Paleogene fossil penguins were described from South Africa, where the earliest penguins stem from late Miocene/early Pliocene deposits (Acosta Hospitaleche 2006). Most fossil species of the Sphenisciformes are based on humeri and tarsometatarsi, which are particularly robust bones and accordingly are dominant in the fossil record. There exist, however, also several partial skeletons, which provide further insight into the early evolution of penguins. As yet undescribed late Cretaceous stem group Sphenisciformes were found on Chatham Island (Hansford 2008). The earliest published fossils come from the late Paleocene (58-61 Ma) of New Zealand and belong to the taxon Waimanu, which includes W. manneringi Jones, Ando and Fordyce, 2006 and the smaller and geologically slighter younger W. tuatahi Ando, Jones and Fordyce, 2006 (Fig. 7.5; Slack et al. 2006, see also Fordyce and Jones 1986, 1990). Substantial parts of the skeleton of W. tuatahi were discovered, including partial skulls. Comparisons between Waimanu and plotopterids have not yet been performed, but Slack et al. (2006, p. 1148) noted that "superficially, Waimanu is similar to geologically younger wing-propelled diving birds, such as the extinct Northern Hemisphere auk Mancalla and the diving plotopterid pelican [sic] Copepteryx." The species of Waimanu had a standing height of 80-100 cm, and were already flightless, wing-propelled divers with an upright stance (Slack et al. 2006). In osteological details, however, they markedly differ from crown group Sphenisciformes. As in other Paleogene penguins, the beak is long and dagger-like. The scapula is not as greatly widened as in crown group Sphenisciformes, and according to Slack et al. (2006) the articular facet of the acrocoracoid of the furcula is projecting; this facet is well developed in the Suloidea but is absent in extant penguins. In contrast to those of crown group Sphenisciformes, the distal portions of the ulna and the radius of Waimanu are not flattened (Fig. 7.5). The tarsometa-tarsus is proportionally longer than in other Sphenisciformes and resembles that of the plotopterid Phocavis. A sister group relationship between Waimanu and all other fossil and extant Sphenisciformes was supported by phylogenetic analyses of Ksepka et al. (2006) and Clarke et al. (2007). As far as this can be assessed from the published descriptions and figures, the taxon differs from the Plotopteridae in the presence of supraorbital fossae for the salt glands, a different shape of the coracoid, and a much shorter acromion of the scapula. A high number of other sphenisciform taxa was reported from the late Eocene and Oligocene of New Zealand, and the following species are currently considered valid (Simpson 1971, 1975; Worthy and Holdaway 2002; Acosta Hospitaleche 2006): Palaeeudyptes marplesi Brodkorb, 1963 (late Eocene), P antarcticus Huxley, 1859 [probably early Oligocene (Worthy and Holdaway 2002)], Pachydyptes ponderosus Oliver, 1930 (late Eocene), Archaeospheniscus lopdelli Marples, 1952 (late Oligocene), A. lowei Marples, 1952 (late Oligocene), Duntroonornis parvus Marples, 1952 (late Oligocene), Platydyptes novaezealandiae (Oliver, 1930) (late Oligocene), P. amiesi Marples, 1952 (late Oligocene), ?P. marplesi Simpson, 1971 (late Oligocene), and Korora oliveri Marples, 1952 (late Oligocene). The standing height of these species varied from about 60 cm in the smallest (Duntroonornis parvus) to about 150 cm in the largest (Pachydyptes ponderosus), which reached twice the size of the largest extant penguin and had an estimated weight of about 100 kg (Simpson 1971, p. 376). By contrast, only three sphenisciform taxa were found in the Paleogene of Australia, i.e., Anthropornis nordenskjoeldi Wiman, 1905 (late Eocene), Palaeeudyptes sp. (Oligocene), and an undescribed smaller species (Vickers-Rich 1991). All fossil penguins from Antarctica come from Seymour Island, where they were already very diversified in the early Paleogene. The earliest species is the late Paleocene (Cross Valley Formation) Crossvallia unienwillia, which was described by Tambussi et al. (2005). C. unienwillia is known from an incomplete humerus, femur, and tibiotarsus and had a large size, similar to that of Waimanu manneringi. Comparisons between Waimanu and Crossvallia were not made by Slack et al. (2006), and are still needed to firmly establish the distinctness of these coeval taxa. Several thousand penguin bones, which accumulated in the vicinity of former rookeries, were collected from the Eocene deposits of the La Meseta Formation of Seymour Island. Myrcha et al. (2002) briefly reviewed the collection history of these specimens and distinguished the following taxa on the basis of their tarsometatarsi: Anthropornis nordenskjoeldi Wiman, 1905, A. grandis (Wiman, 1905), Palaeeudyptes gunnari (Wiman, 1905), P klekowskii Myrcha et al., 1990, Delphinornis larseni Wiman, 1905, D. gracilis Myrcha et al., 2002, D. arctowskii Myrcha et al., 2002, Mesetaornis polaris Myrcha et al., 2002, Marambiornis exilis Myrcha et al., 2002, and Archaeospheniscus wimani Marples, 1952. Jadwiszczak (2006a) identified other postcranial elements of these species, and Ksepka and Bertelli (2006) reported cranial remains, which could, however, not be assigned to particular taxa. Tambussi et al. (2006) further described humeri from the La Meseta Formation as Tonniornis mesetaensis and T. minimum, but these identifications were disputed by Jadwiszczak (2006b). Tambussi et al. (2006) also assumed the presence of Archaeospheniscus lopdelli and Palaeeudyptes antarcticus in the Eocene of Seymour Island. These two species are otherwise only known from the Oligocene of New Zealand. Their identification in the fossil record of Seymour Island was likewise questioned by Jadwiszczak (2006b), who also commented on some penguin specimens from the early Eocene of the La Meseta Formation. Jadwiszczak (2008) described a new but as yet not named small sphenisciform species from the late Eocene of the La Meseta Formation, which is represented by a fragment of the proximal tarsometatarsus. The earliest South American fossil Sphenisciformes are Perudyptes devriesi Clarke et al., 2007 from the middle Eocene of Peru and an unnamed species from the late middle Eocene of Tierra del Fuego (Argentina) (Clarke et al. 2003, 2007). P. devriesi was about the size of the extant King Penguin (Aptenodytes patagoni-cus) and is known from a partial skeleton including substantial parts of the skull, whereas the equally large Argentinian specimen consists of portions of the pelvis and hindlimb elements, including a complete femur. to Acosta Hospitaleche (2006) and Acosta Hospitaleche et al. (2004), include the late Eocene/early Oligocene Arthrodytes andrewsi (Ameghino, 1901) and Paraptenodytes robustus (Ameghino, 1895), as well as the late Oligocene/early Miocene Eretiscus tonnii (Simpson, 1981), which is among the smallest species of Paleogene Sphenisciformes. As already noted by Simpson (1975), Paleogene penguin faunas were much more diversified than the extant ones, and ten to 14 sympatric species coexisted in the late Eocene of Seymour Island alone (Tambussi and Hospitaleche 2007). The Eocene penguins from Seymour Island show a remarkable variation in size, from small species the size of the extant Macaroni Penguin, Eudyptes chrysolophus, to the largest known penguin, the giant Anthropornis nordenskjoeldi, which reached an estimated standing height of about 1.7 m (Jadwiszczak 2001). A. grandis and the species of Palaeeudyptes were also much larger than extant penguins, and the large size range spanned by these species may have facilitated coexistence of so many taxa in a geographically restricted area (Ksepka et al. 2006). It is further remarkable that, if the above lists reflect the true taxonomic composition of Paleogene Sphenisciformes, the South American species appear to have been quite distinct from those of Antarctica and New Zealand which share at least some "genera" (Simpson 1975; Acosta Hospitaleche et al. 2004). Another outstanding peculiarity of Paleogene penguins is the very large size of many species, with representatives of the taxa Anthropornis, Pachydyptes, Icadyptes, Palaeeudyptes, and Archaeospheniscus having been distinctly larger than the extant Emperor Penguin. 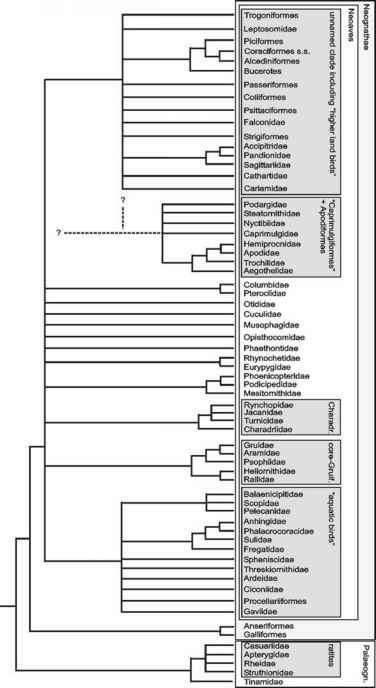 According to a phylogenetic analysis of Clarke et al. (2007), giant size, i.e., a standing height of about 1.5 m or more, evolved only once within Sphenisciformes, in the early Eocene, and persisted into the Oligocene, across the Eocene-Oligocene climate transition which marks the onset of global cooling. Ksepka et al. (2006) further alluded to the fact that attainment of a large body size must have occurred rapidly in the early evolution of penguins, as even the Paleocene species Waimanu manneringi and Crossvallia unienwillia were as large as or even larger than the Emperor Penguin. Concerning extant penguins, the large Aptenodytes species occur in the extreme south, whereas the small forms are found in New Zealand, southern Australia and Africa, and the Galapagos Islands. It was thus suggested by earlier authors that there is a correlation between size and latitude in penguins, in accordance with Bergmann's rule, which states that within clades of endothermic animals the species in colder climates are larger than closely related ones that live in warmer areas. However, the validity of this rule in the case of Sphenisciformes was questioned by Simpson (1971). In fact, the average size of penguins seems to have become smaller over the Cenozoic global cooling (Clarke et al. 2007), and fossils of the giant Pachydyptes ponderosus were found associated with warm-water foraminif-erans (Clarke et al. 2007; see also Tambussi et al. 2006). From the occurrence of the large Icadyptes in near-equatorial fossil deposits, Clarke et al. (2007) concluded that giant size in Paleogene penguins is not correlated with either cooler temperatures or higher latitudes, but may be due to increased ocean productivity. However, to explain the body size of these early Sphenisciformes, it may be more appropriate not to ask why there were such large species in the past, but why there are none today (see Sect. 17.3.3.2). The phylogenetic affinities between Paleogene Sphenisciformes are incompletely understood, and only very recently more comprehensive phylogenetic analyses were performed (Ksepka et al. 2006; Clarke et al. 2007). The tarsometatarsi of Waimanu, Delphinornis, Marambiornis, and Mesetaornis still exhibit a distal vascular foramen, which is lost in other sphenisciform taxa. A position outside crown group Sphenisciformes for these taxa and all other Paleogene penguins is also supported in the analyses of Ksepka et al. (2006) and Clarke et al. (2007). Among others, in most Paleogene Sphenisciformes the pneumotricipital fossa of the humerus is simple and not bipartite as in extant penguins, the tarsometatarsus is more elongated, the metatarsals are more strongly fused (Myrcha et al. 2002), and the hypotarsal crests are better developed (Jadwiszczak 2006b). In many Paleogene Sphenisciformes the distal margin of the sternal extremity of the coracoid is further convex rather than concave as in extant penguins (Simpson 1975; see Fig. 7 in Ksepka et al. 2006). The giant species were classified into the Palaeeudyptinae by Simpson (1971), but the analyses of Ksepka et al. (2006) and Clarke et al. (2007) did not support monophyly of this taxon. Waimanu and other Paleogene Sphenisciformes have a very long and dagger-like beak (Olson 1985; Slack et al. 2006; Clarke et al. 2007). In its extreme, this presumably plesiomorphic morphology is displayed by Icadyptes salasi, whose beak measures about twice of the length of the cranium (Fig. 7.6; Clarke et al. 2007). Ksepka et al. (2008) confirmed the earlier hypothesis that the beak of these birds was probably used for spearing large prey items. These authors further detailed that the rhamphotheca of Icadyptes was considerably thinner than in extant penguins. If the identification of some fragmentary bill remains by Jadwiszczak (2006b) is correct, not all early Paleogene taxa had, however, such dagger-like beaks. Paleogene stem group Sphenisciformes further show strongly developed temporal fossae for a powerful adductor muscle complex, which indicates that they may have been more specialized toward feeding on fish than on planktonic prey (Ksepka and Bertelli 2006; Ksepka et al. 2006). Glaciation of the Antarctic continent resulted from formation of the circum-Antarctic current after the late Eocene (about 36 Ma) opening the Drake Passage, which separates South America from Antarctica (Woodburne and Case 1996). The origin of Pan-Sphenisciformes clearly predates this event (Myrcha et al. 2002; Tambussi et al. 2005). Baker et al. (2006) assumed an origin of crown group Sphenisciformes in the Eocene of Antarctica, and further hypothesized that climatic cooling had a major impact on their subsequent evolution. However, Clarke et al. (2007) found no evidence for a correlation between major events in penguin evolution and either formation of the circum-Antarctic current or onset of Cenozoic global cooling. The same conclusion was reached by Ksepka et al. (2006), who noted that geographic events, such as changes in marine currents and emergence of islands, may have had a greater impact on penguin evolution than climatic cooling itself (see also Sect. 17.3.3.2). When did the pachydyptes exist?